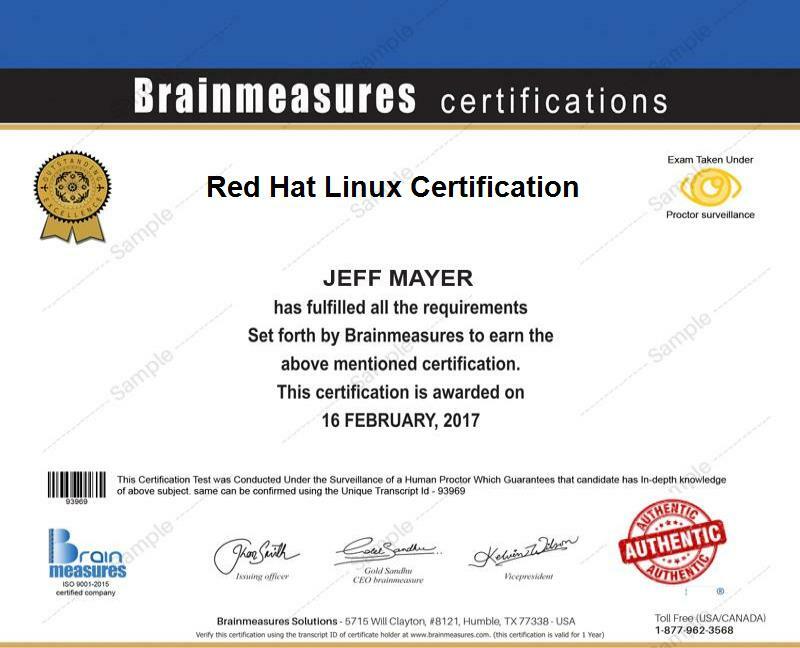 If you want to become a Red Hat Linux expert, then be aware that Brainmeasures, which has become well-recognized worldwide because of its ability to supply the public with the most accurate, reliable and updated online certification courses, can help you out with its Red Hat Linux certification program. The Red Hat Linux course offered by Brainmeasures is proven to be highly accurate so you have a hundred percent assurance that you will be able to boost your skills and expertise in this field after you complete the course. With the help of this certification course, you will get the chance to undergo a Red Hat Linux training which can assist you in learning everything about this popular operating system, its major functions and roles, installed features, its different versions and the many techniques that you can use in maximizing its performance. As soon as you receive your Red Hat Linux certificate, you can start offering your highly competitive skills and expertise in this area to those who desperately need them. How to effectively issue Linux commands? How to effectively set up WAN in Red Hat Linux? The Red Hat Linux certification program which is now available at Brainmeasures is extremely useful to a wide range of individuals and professionals. You can expect this certification course to work suitably for developers, system administrators, programmers, consultants and any other IT professionals who wish to start taking advantage of Red Hat Linux operating system and improving their productivity through it. Being able to finally take a hold of your Red Hat Linux certification is also a major help in further increasing the level of your income. You can use your Red Hat Linux certification to work as a Red Hat Linux specialist which offers an annual salary of around $71,000 to $109,000. You may also get the position of a Red Hat Linux consultant which allows you to receive a more profitable pay of around $89,000 to $154,000 annually.